Calm your hearts. There's still unlimited bagnet. 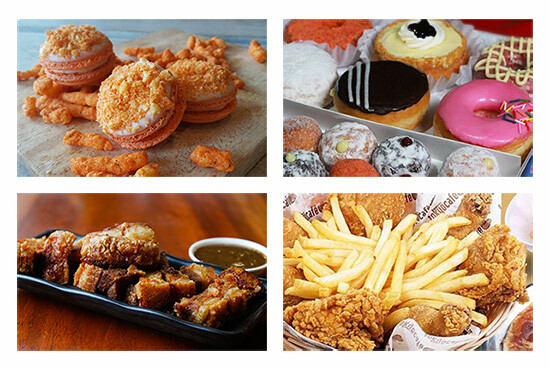 (SPOT.ph) This week, score free macarons, unlimited pizza, free drinks, and unlimited bagnet. Plus, it's Graduation Season! Check out what some restaurants have in store for 2016's proud graduates (yup, moving up from kindergarten counts!). Make sure to show your ID when you order at Big Guys!. Students (from kindergarten to post-graduate degrees) get 10% off on any order, any size, any flavor. Click here for a list of Big Guys! Pizza branches. Bring your whole family to Tokyo Cafe during the weekends (Friday to Sunday). 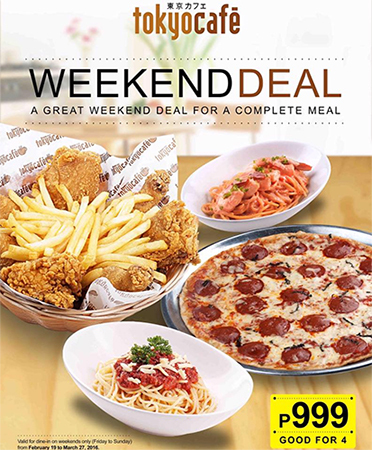 Until March 27, they're offering a Weekend Deal, which consists of fried chicken and fries, two pasta dishes, and pizza, for only P999. Click here for a list of Tokyo Cafe branches. 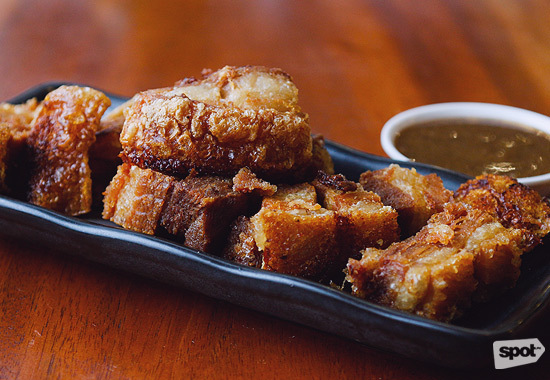 Sinigang's unlimited fried pork belly for P285 per head will last till the end of March, but they've just announced that the deal is now also available during the weekends. Don't worry, it still comes with unlimited rice (plain and bagoong) and unlimited iced tea. Read more about Sinigang's Unli-Bagnet. Sinigang is at 162 Aguirre Avenue, BF Homes, Parañaque City. 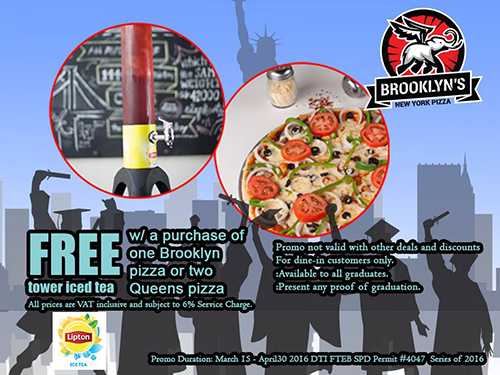 Here's another graduation special: Purchase one Brooklyn pizza or two Queens pizzas and you can get a tower of iced tea for free. You have to present proof of graduation, though, so make sure you roll up your diploma and put it inside your purse. Click here for a list of Brooklyn's New York Pizza branches. It's a Dunkin' party today, March 19. 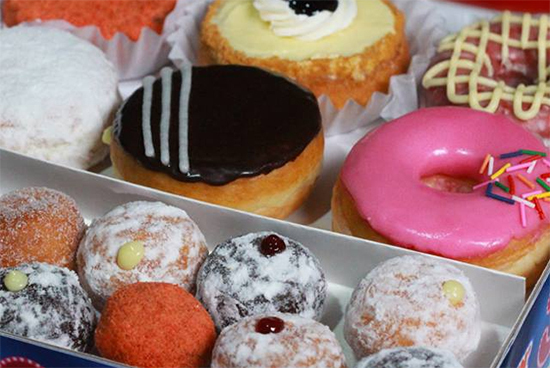 Pay only P349 for donut sets, like (1) a Box of Three (that's six donuts and three cups of coffee) and the Obsession Collection (a dozen Munchkins and six donuts); (2) a Box of Three and a classic dozen; or (3) two Obsession Collections. Read more about the Dunkin' Sale. 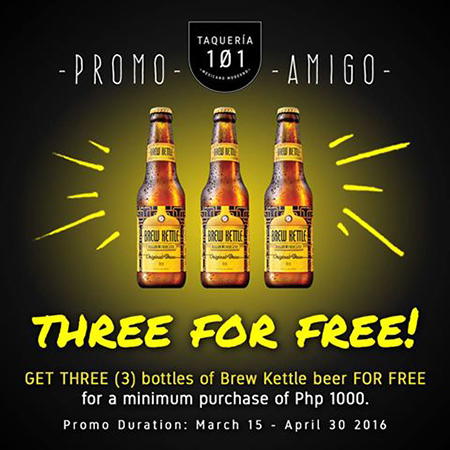 Every single-receipt purchase worth P1,000 at Taqueria 101 will get you three bottles of Brew Kettle on the house. Taqueria 101 is at 101 Doña Soledad Building, Better Living, Parañaque City. Are you graduating this month? Make sure to veer the celebrations towards Peking Garden. If your bill reaches P5,000, you get a complimentary plate of Australian beef fillet. Bring a valid ID as proof! 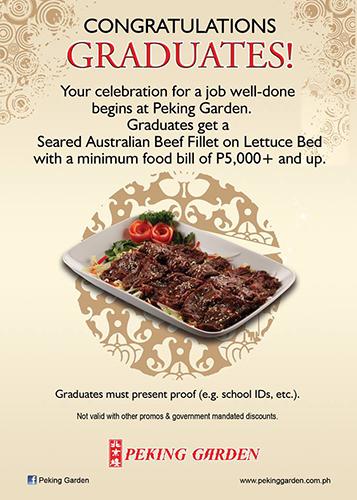 Peking Garden is at Greenbelt 5, Makati City. 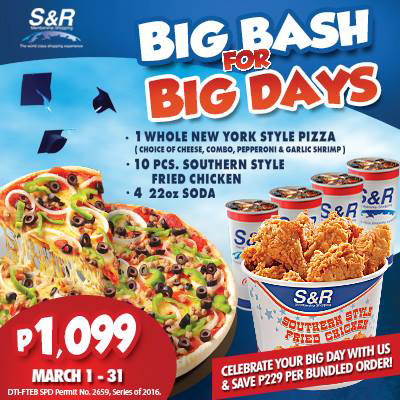 Get a whole New York Style Pizza, 10 pieces of fried chicken, and four 22-ounce sodas for only P1,099 at S&R this entire month of March. Click here for a list of participating S&R branches. 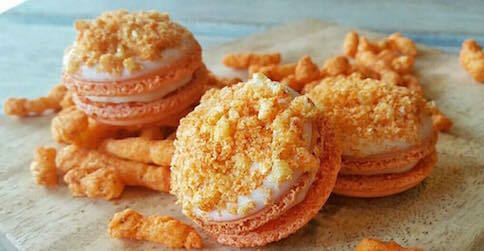 On March 20, buy Mrs. Graham's new Cheetos macaron and you can get a free basic flavor of your choice. Only one freebie is valid per customer. 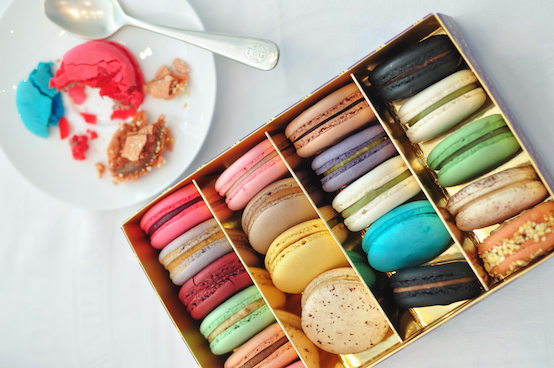 Mrs. Graham's Macaron Cafe is at 51C Scout Rallos Street, Barangay Laging Handa, Quezon City. Mark your calendars. 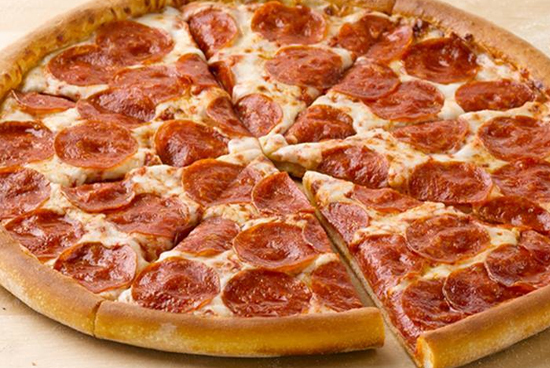 March 27 is the return of all-you-can-eat pizza! 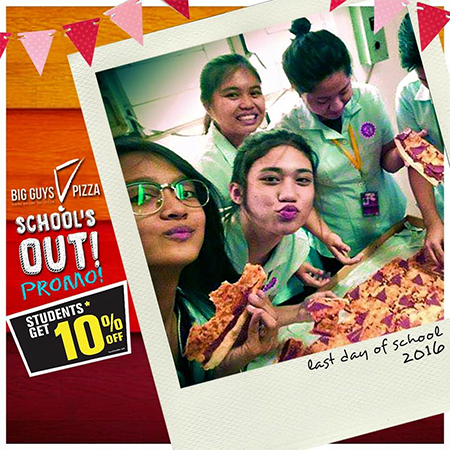 Pay only P255 for unlimited pizza and a bottomless drink. If you want a little break from the bread, add P50 for single-serve pasta. Read more about Papa John's Unli Pizza campaign.